Will keep the rooms above your garage noticeably warmer and helps to keep wind and rain out of your garage. Perimeter Weatherstripping (top and sides), available in eleven factory colours. Lubrication of all moving door hardware with Special Fluid Film lubricant. 20 point service inspection and a written report. We also stock two styles of one-piece door bottom weatherstrip and many types of replacement bottom weatherstrip for sectional doors. 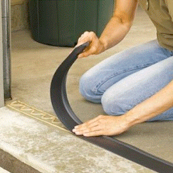 We stock Storm Shield as well, to seal between the bottom of the garage door and the floor.